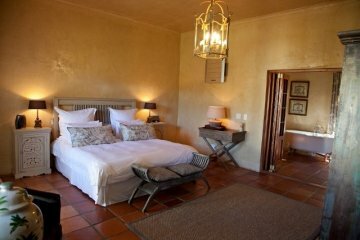 Avondrood Guesthouse is a charming, well maintained Victorian Cape Dutch style house built in 1870. It has been tastefully renovated adding modern day comforts whilst retaining many features of the original building. There are six generous rooms, each with a destinctive decor, creating a unique ambiance and with luxurious comforts of its own. The premises are surrounded by a lush 2000 square meter garden with private swimming pool and jacuzzi. Avondrood Guesthouse is a charming well-maintained Victorian Cape-Dutch style house built in 1870. It has been tastefully renovated adding modern-day comforts whilst retaining many features of the original building. There are six generous rooms (one being a two bedroomed family suite), each with a distinctive décor creating a unique ambiance and with luxurious comforts of its own. The premises are surrounded by a lush secluded 2000 square metre garden with private swimming pool and jacuzzi.